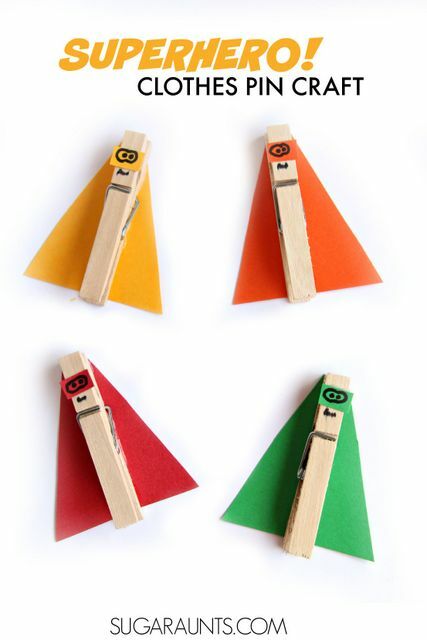 Practice skip counting to 1,000 with a superhero theme using this adorably cute super hero clothes pin craft. Making the superheros are a fun craft that works on fine motor skills while practicing second grade math concepts. 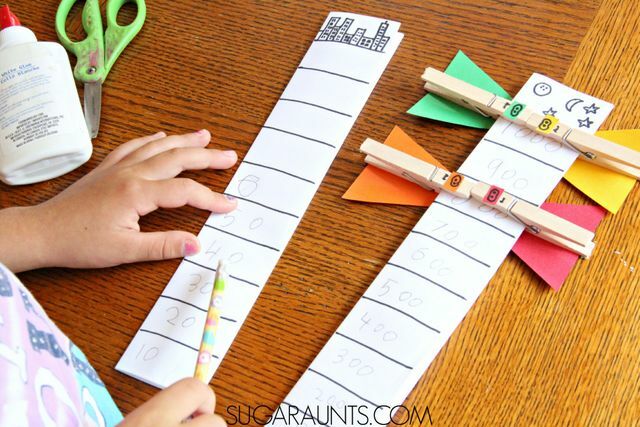 We're joining other bloggers in a weekly series where we explore second grade concepts this school year and our Superhero Skip Counting to 1000 activity is a fun way to zoom into second grade math! The school year is about to begin and we will have a second grader in our house. HOW did that happen?? She loved math in first grade and I'm excited to see her growth and learning this year in second grade. 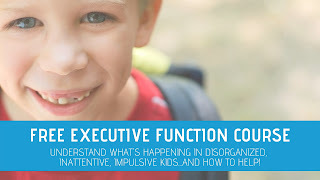 We do so many enrichment and homework extension activities and it is fun to come up with creative ways to practice what the kids have been learning in school. 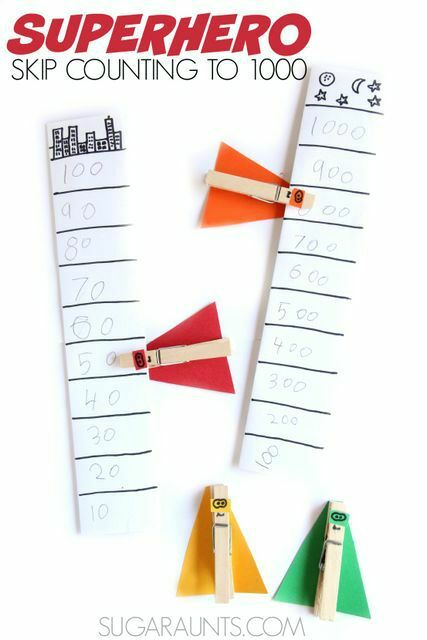 This Superhero Skip Counting Activity was a fun way to practice skip counting and basic addition up to 1000. 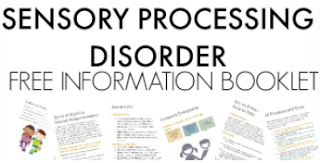 (Affiliate links are included in this post). Cut the card stock into triangle shapes with a flat top. Measure the size against the length of the clothes pins. Glue the Triangle to one long side of the wooden clothes pins with the narrow part of the triangle at the part that pinches. The "head" of your superhero will be the part that pinches paper. Cut small rectangles from the card stock to fit the width of the clothes pins. These will become the superhero's mask. Glue the mask onto the clothespin about a 1/4 inch from the top of the clothes pin. Use the permanent marker to draw a smirk (or angry face, if you like) and eyes on the mask. These superheros are ready to fight math crime! Next, we used the printer paper to create strips of paper that became our math skip counting columns. Simple fold the paper into quarters lengthwise. Then, use the sharpie to draw ten horizontal lines. You can draw a picture at the top of the strip of paper, like buildings, stars, a medal, or other superhero-ish pictures. We made four strips of paper and my daughter wrote in numbers. On one strip she wrote 1-10. 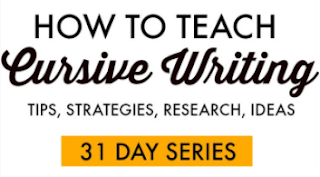 On the second, she wrote 1-100 by tens. On the third strip she wrote 5-50 by fives. On the last strip, she wrote 100-1000 by hundreds. We then used the superheros to skip count up to 1000. She was able to use the various strips together to do basic adding by 1's, 5's, 10's, and 100's. One of the standards in second grade math is understanding place value. Skip counting to 1000, and reading and writing numbers up to 1000 are important concepts in place value. 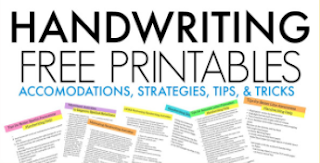 You can position the hundreds strip next to the ones strip and easily note that the numbers 100, 200, 300, 400, 500, 600, 700, 800, and 900 refer to one, two, three, four, five, six, seven, eight, nine, or ten hundreds (and 0 tens and 0 ones). 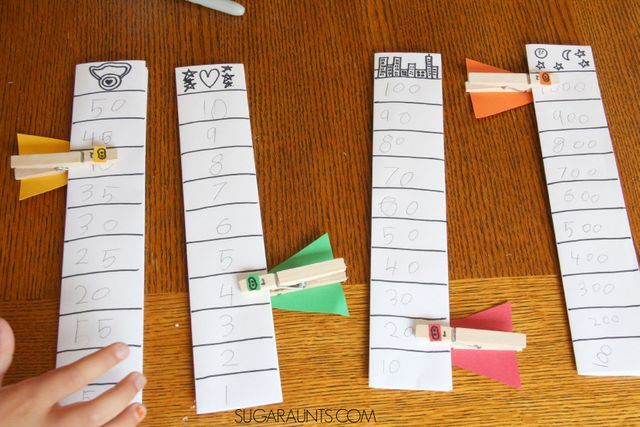 There are so many ways to use these superhero skip counting strips and superhero counters. My daughter has been using them every day (and carting them around in her Frozen tote bag) to count out how many silly band bracelets she's made. She will slide the superhero counters up the strips one by one on the ones strip. Then when she reaches the 10, she slides the superhero up on the tens strip. She's got a long way to go to reach one thousand silly band bracelets, but she sure does have lofty goals (and a super fun superhero way to keep track)! 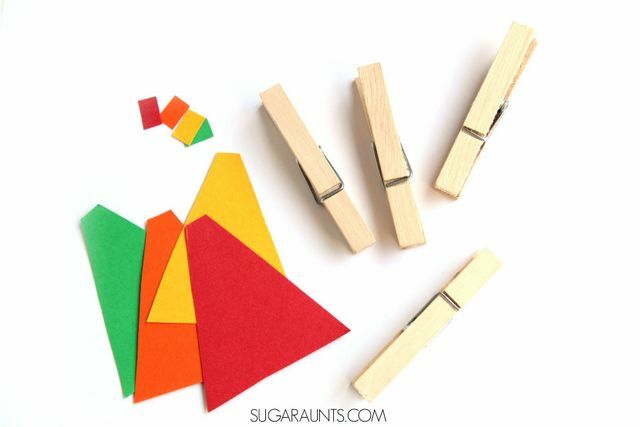 These make a great fine motor strengthening activity, too. 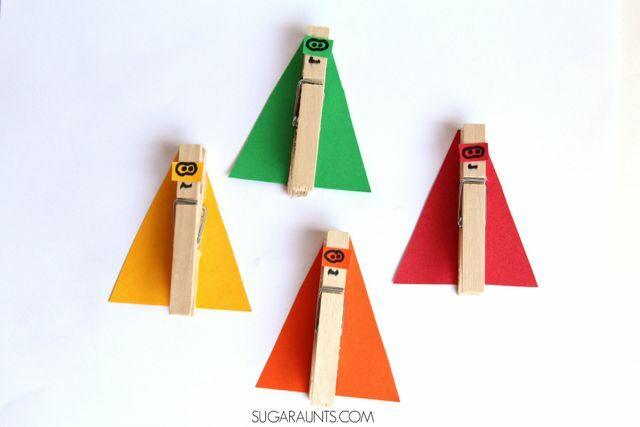 Pinch these superheros on yarn or paper for superhero fine motor strength! 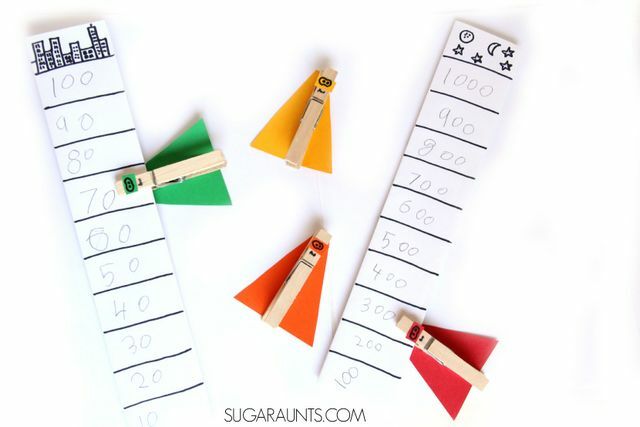 Follow Sugar Aunts's board Playful Math on Pinterest.